Why did you choose to do an online magazine? Great question! Well, when I was a little girl, I loved getting American Girl Magazine. I was so thrilled every time I ran outside in bare feet to find the hidden magazine treasure in the mailbox, or when Dad would come home with a new issue in the middle of a snow storm. Besides having happy memories about magazines, I also have a passion for writing. To me, I love choosing a theme and pulling in a diverse crowd of writers and topics and somehow tying them all together under one theme. When I was really young I used to write newsletters for my friends, and I even had a website once before when I was about thirteen. The internet is such an amazing way to instantly reach a crowd with a message...and much faster then old-fashioned magazines! So for me, choosing to do an online magazine was kind of a no-brainer! 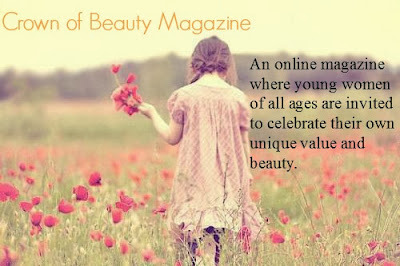 How did you come up with Crown of Beauty Magazine? Why did you feel the need to write a book for teen girls? The short answer? Because I know what I was like as a fourteen year old girl crushing on Nick Jonas! The long answer? So many girls grow up thinking that all the boy advice they'll ever need can be found in popular teen magazines, or on the phone with their best friends. But the advice that we're getting from some of our "best advice" sources is actually pretty terrible. Everything we need to know about relationships can be found in the Bible, and through one on one communication with God in prayer. But how many girls actually spend time in the Word, seeking answers for their love lives? Sometimes it's helpful to have someone who has already been there and done that, and has dug into the deep diamond mines of God's Word and dug up some gold to share. Not that this or any other book should be a substitute for getting these answers from God Himself...but I thought, as along as I have this all locked up inside I might as well share it! Have you learned anything new since writing the ebook? Yes. I have learned that I can actually complete a book! For the longest time, I thought I would have to either get signed by a publishing company or pay a really hefty fee to a self-publishing house. Then I learned about these trendy little things called e-books, and how you can create them using Open Office or Microsoft Word. I was so elated! Now I could write as many books as I wanted, and after being edited and spiffed up a bit, readers can instantly download them. It's pretty cool. I learned a few days ago that someone in Mongolia downloaded my book. Like--what?! How amazing! In regards to the book there is an overwhelming since of encouragement when reading it, did you write it in a purposefully encouraging way? Absolutely! One of my biggest love languages is words of affirmation and encouragement. I'm the type of girl who, if I get a cute little e-mail, or message on FB that encourages me, my heart soars. I like to think of When Life Feels Like a Taylor Swift Song as one big letter of encouragement, carried via carrier pigeon from one princess locked in a tower to another. So many of us are sitting around, like Rapunzel, waiting for our Flynn Rider to appear, and things can get kinda lonely! For me, it's really encouraging to know that other girls feel the same way I do...and that was a huge reason for writing this book. Since writing the book are there any changes you would want to make? Mmm...probably not. I'm sure if I look back at it a month from now, I'll think, "Oh dear! We need to make changes!" But it's always that way with creative works of art. Once something is done you have to just leave it, or else you'll continue revising it for the rest of your life. Hahaha. It was kind of hard though, just a few days before the book was finished. That's when I wanted to change it the most. That's when the enemy placed doubt in my mind and I started asking myself, Why am I doing this? I'm only nineteen and I've never even been on a date! What credibility do I have to help girls out in their relationships when I've never even BEEN in one? What qualifies me to write this? Inner critics tried to shut up my voice, but a louder voice triumphed. I was reminded that I have the only two qualifications that matter. Number one, I have a relationship with the only One who matters, and who is the EXPERT of all relationship advice! And He has graciously taught me so much about guarding my heart, waiting for my future prince charming, and what to do once he arrives. And number two, I deeply care about my sisters in Christ. I wrote this whole book like a letter to my best friend, or little sister, or peers who are going through the same stuff I do when it comes to boys. So yes, I learned that I don't have to be married, engaged or even dating someone to write a book about boys and true love. In a lot of ways, this was a huge step of faith for me. This is my stepping out on a limb and saying, "I know God is faithful and His ways to do relationships are right and true!" Do you anticipate writing another book? ABSOLUTELY. When I started this project, it was actually called "A Girl's Guide to Being a Girl". It was a massive book that covered many topics including true beauty, boys, fashion, changes, chasing your dreams, and having relationship with God...it was really big and a little bit overwhelming. After talking with my editor and my Mom, we decided to downsize it and divide the book into several more "digestible" sections. So, there are certainly more books to come! Do you know a topic yet and can you share it with us? This is still on the drawing board, but I think the next book I would like to release in the "Girl's Guide" series, is about true beauty. It's just something that I'm so passionate about...I hate seeing my generation so deceived and thinking they are worthless. I would love if my next book is about this! I just want to say a huge THANK YOU to Livy for sharing with us!